We all have duties and responsibilities, but did you know that the term duty is actually a legal term and virtually every restaurant employer and employee is required by law to comply with OSHA’s General Duty Clause? It is not an option. This Clause plays a significant role in the safety and health of all industries, including the restaurant industry. Surely, we can all agree that regardless of where it exists or what industry it falls within, the workplace should always be as safe, healthy, and secure as reasonably and humanly possible. In fact, creating and maintaining an environment that is anything to the contrary would be ill-advised and inherently dangerous. OSHA and the General Duty Clause of OSHA are about so much more than merely providing safe working conditions for working people – especially as it applies to an industry like ours where the customers we serve and the vendors we do business with and countless others share the same space that is used by the restaurant employees while they are performing their job duties. OSHA is about providing safe, healthy, and secure premises and safe, healthy, and secure conditions for people – all people who enter the worksite or workspace where and while employees are working. Just because a particular hazard or dangerous condition is not specifically referenced in an OSHA Standard does not mean that an employer is not legally required to implement an industry standard or a site-specific standard (or even just plain old common sense) in order to remove a hazard or a dangerous condition in which someone could become injured, harmed, sickened, maimed, or killed. In fact, it is quite to the contrary. If a hazard or dangerous condition exists, it must be blocked off, eliminated, reduced, or removed by restaurant management immediately. 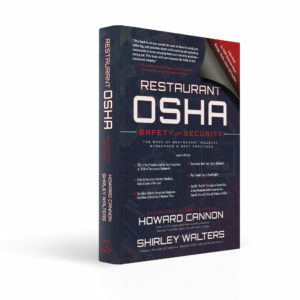 For more information about restaurant industry standard and how The General Duty Clause applies to and affects restaurants, check out Restaurant OSHA Safety and Security, and visit Restaurant Expert Witness to learn more about Howard Cannon and his restaurant and bar expert witness services. If you are an attorney interested in reviewing a copy of Restaurant OSHA Safety and Security, please call us at 800.300.5764 or send us an EMAIL.